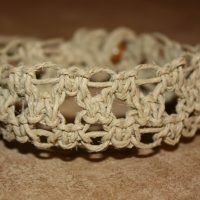 This 9 inch anklet is made up of eight strands of hemp, weaved together. 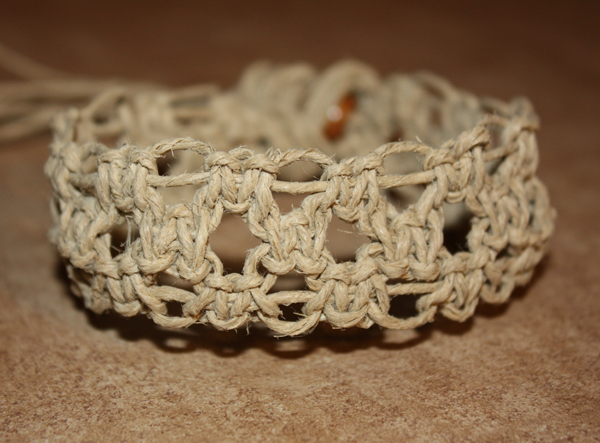 What I did was collect 4 strands of hemp and fold them over creating 8 total strands. I did 3 regular knots on either side with 4 strands still available in the center. Then I did 3 regular knots in the middle of those center 4 strands and repeated the process. Unfortunately I also managed to get a hemp splinter on my finger (this hemp is a little rough and those pieces you see in the picture that are poking out…they make a mean splinter if you get one fine enough in your skin. Customize the length and buy now!